A favorite side dish around here for Thanksgiving and Christmas is Candied Sweet Potato Casserole. My mom found this particular recipe a long time ago from America's Test Kitchen. What she liked was the cooking method and the ability to make the dish, up to a point, ahead of time to help cut down on Thanksgiving Day cooking. The sweet potatoes are peeled, sliced, and added to a skillet with melted butter along with brown sugar, salt, pepper, and water, then covered and cooked until tender. The lid is then removed and the heat raised so the liquid is reduced to a glaze. Since we usually double the sauce ingredients you can remove the sweet potatoes after 10 minutes and continue cooking down the sauce if it still hasn't reduced enough. I think you're aiming for a slightly thickened glaze as it will continue to cook in the oven. This is the point where you can refrigerate until needed. Normally you put the sweet potatoes into a casserole dish, but for the sake of now I'm showing two different toppings in small amounts in my ramekins. 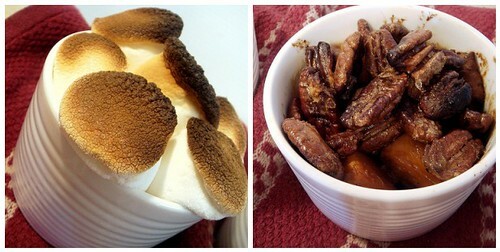 One is the candied pecan topping and the other is the classic and beloved marshmallow topping. 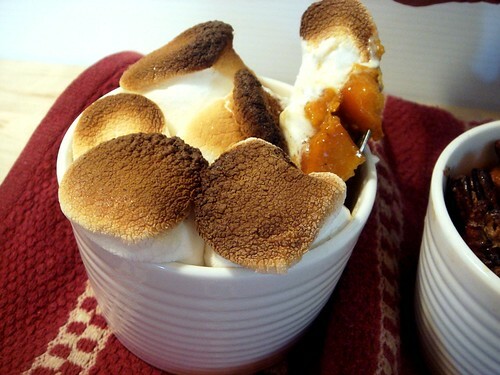 Since the marshmallows get added last, I covered the ramekin with foil. 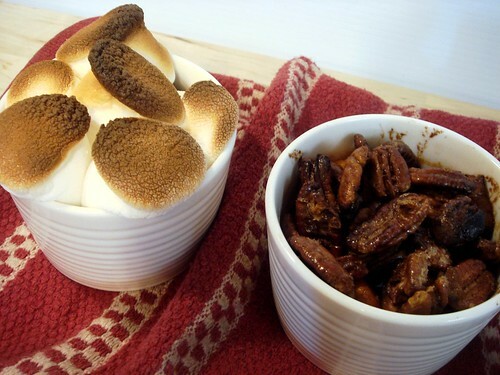 Both should have been covered, and the ramekin with the pecans uncovered for the last 5 minutes. 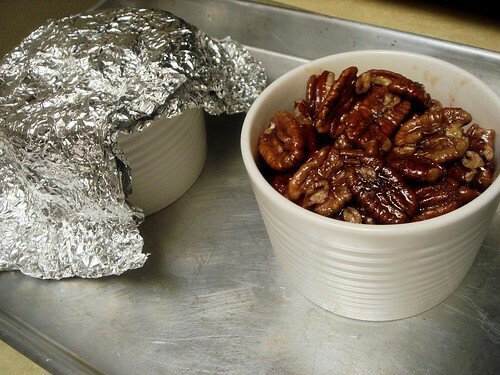 The heat at which the casserole cooks is high and my pecans burnt along the edges. (I also toasted the pecans a bit to help with the flavor, so possibly that's why.) The reason I would suggest covering both is that the uncovered sweet potatoes dried out more and weren't as saucy. After removing from the oven, turn the broiler on to high. Broiling the marshmallows instead of baking them until toasted is the preferred method for two reasons: Reason 1, it's quicker. Reason 2, since it's quicker, the marshmallows retain their shape longer because the innards haven't yet been heated as much. We actually prefer the version with the marshmallows because it adds a different flavor when paired with the sweet potatoes and the sauce. It's quite delicious. For the Sweet Potatoes: Melt the butter in a large Dutch oven (Me: we use a large, deep skillet) over medium-high heat. 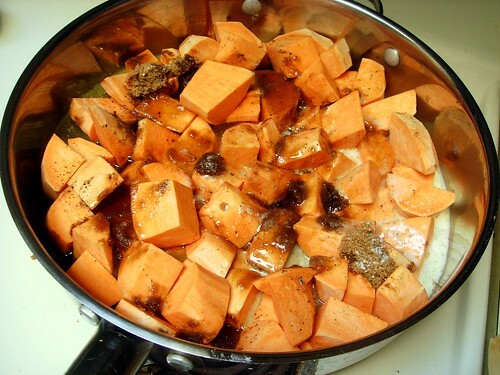 Add the sweet potatoes, brown sugar, salt, pepper, and water; bring to a simmer. 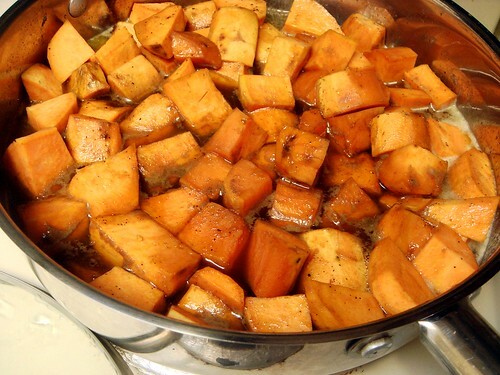 Reduce the heat to medium-low, cover, and cook, stirring often, until the sweet potatoes are tender (a paring knife can be slipped into and out of the center of the potatoes with very little resistance), 45 to 60 minutes. 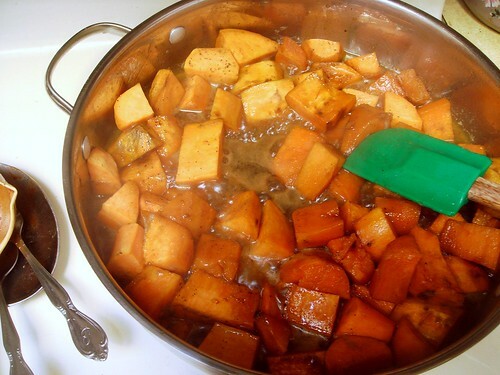 When the sweet potatoes are tender, remove the lid and bring the sauce to a rapid simmer over medium-high heat. Continue to simmer until the sauce has reduced to a glaze, 7 to 10 minutes. For the Topping: Meanwhile, mix all the ingredients for the topping together in a medium bowl; set aside. oh that looks so good! i've never had candied sweet potatoes, but i think i'll make this dish for thanksgiving this year! Yeah, this sounds great! 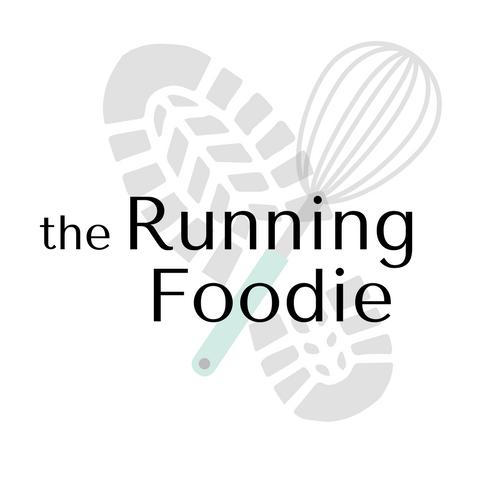 I love candied (anything) I mean, sweet potatoes! Favorite Thanksgiving side dish? Mmm, oyster stuffing or mashed potatoes (made with sour cream)! I made this recipe last year, (using the pecan topping) peeling and dicing sweet potatoes is a workout! This year, I used store-bought, canned sweet potatoes. Much easier and tastes just as good. I'm trying to find the nutritional value for this recipe. Any one have any ideas??? Late reply, sorry! If you input the ingredients into a calculator (sparkpeople has one, I think? ), you will be able to find out.